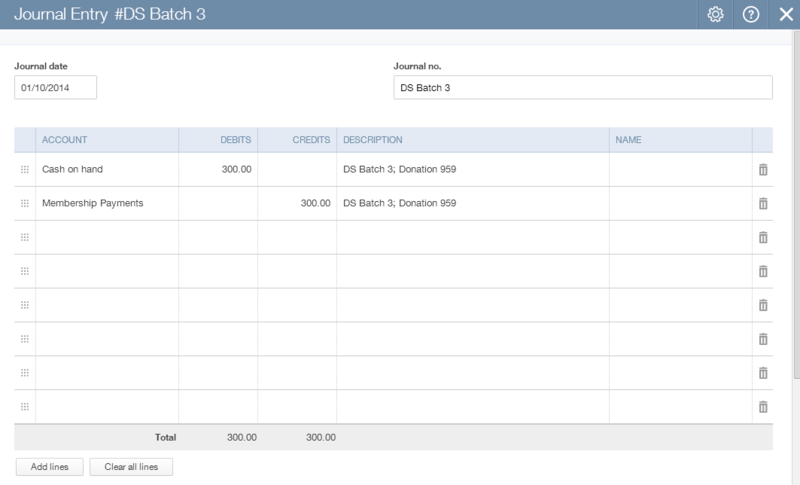 DonorSnap is able to integrate your database with your QuickBooks Online account. 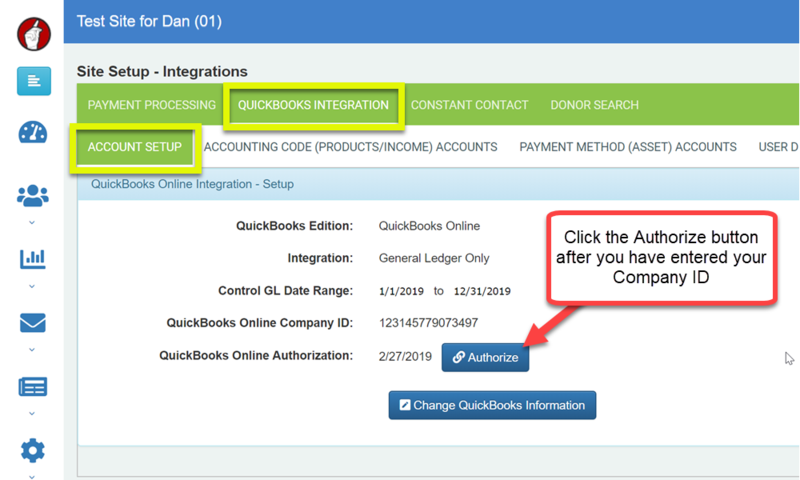 This integration requires some setup before it can be used the first time, but after it has been configured, donations can be easily sent to QuickBooks in batches. 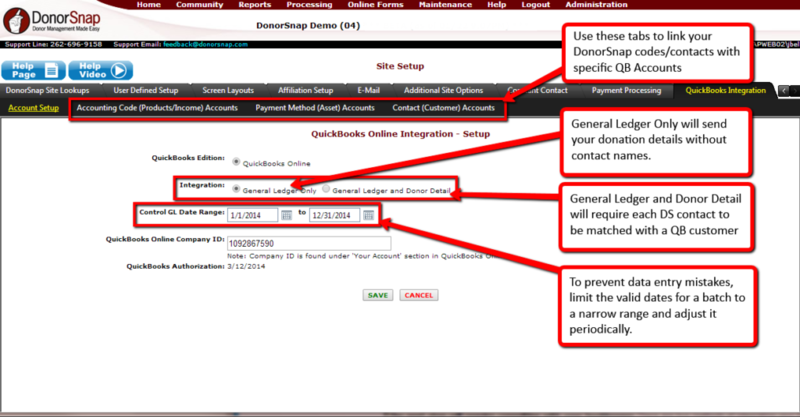 If you are using the installed desktop version, read the QuickBooks Desktop Integration Setup Guide. 6. Click the Authorize button and follow the directions from Intuit. Having trouble finding your Company ID? If the above process does not work for you, you can use the keyboard shortcut to find in on the home screen of QuickBooks Online. Press CRTL ALT ? at the same time to reveal your Company ID. Copy only the numbers before the H when you use this method. The next step will require consulting with your bookkeeper There are two methods of integrating your DonorSnap donation records with QuickBooks: General Ledger Only -or- General Ledger and Donor Detail. General Ledger Only: This option will require the least amount of setup. It will create a transaction with a debit in your asset account and a credit in your income account along with a description stating the batch that the donation was integrated using and the DonationIPK number to identify which donation it was. General Ledger and Donor Detail: This option will require considerably more setup. Each contact in DonorSnap will need to be individually matched with the QuickBooks Display Name field in their customer account. This method will create a sales receipt for each customer which will include a description stating the batch that the donation was integrated using and the DonationIPK number to identify which donation it was just like the one above. The only difference is that it will be credited to a customer account using a sales receipt instead of a journal entry. 1. Link your DonorSnap Accounting Codes with the appropriate Income Accounts (general ledger only setting) or Product/Service Name (donor detail setting) from your QuickBooks and validate them. 2. Link your DonorSnap Payment Method Codes with the appropriate asset accounts from your QuickBooks and validate them. 3. 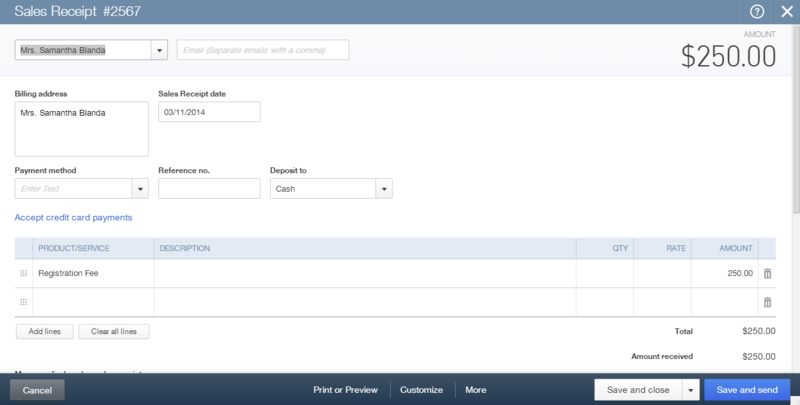 Optional: If using Classes in QuickBooks, create a user defined field called QBClass and link them together. A. Go to Maintenance > Site Setup > Field and Screen Customization and click the User Defined Setup tab. B. Change the activity table from Contact to Donation and click the “Add New Record” button. C. Label your field QBClass and make it a single select dropdown field. D. Click the sub-tab “Lookups for User Defined Controls” and add the options you need under the QBClass field. E. Switch to the QuickBooks Integration tab of the Site Setup page, and click the “User Defined QBClass (Class) Accounts” sub-tab. F. Link your QBClass options in DonorSnap to the Classes in QuickBooks. 4. 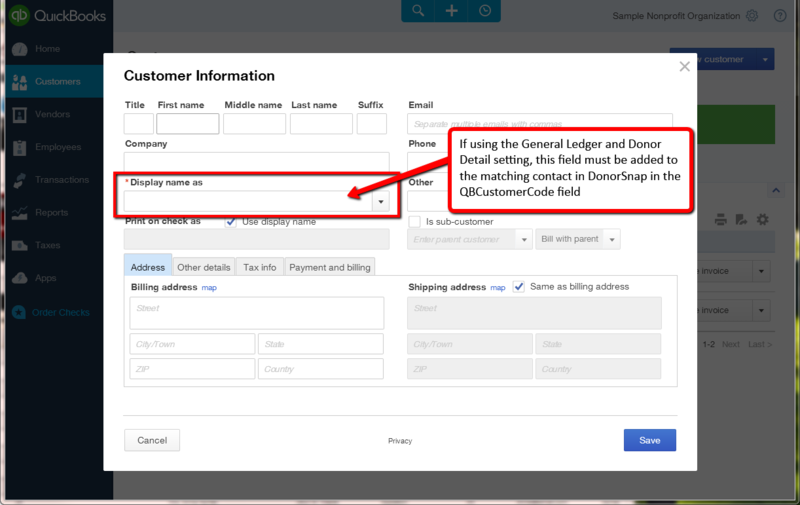 (Only for Donor Detail integration method) Link your DonorSnap Contacts with the appropriate Display Name from your QuickBooks and validate them.